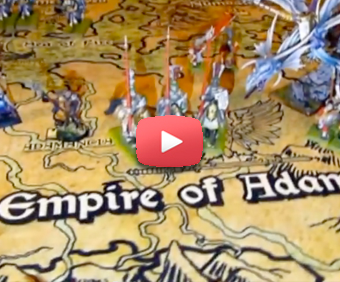 Dear ageofgames supporters and indiegogo contributors, finally Fantasy Kommander-Eukarion Wars is Reality! Your help was crucial and we will consider you as a brother in arms on the battlefield of the development of this long and difficult project. If you are a supporter of ageofgames.com (from before 19th of June 2013), or you have contributed to the Indiegogo campaign, in order to download your copy of the game you have to send an email to info@pmstudios.it specifying your name, surname and the email address that you used to make the donation on Age of Games or Indiegogo (please specify if you are an AOG supporter or a backer on indiegogo.com). Then we'll send you a coupon-code that you can use on the publisher's website to download the game (http://www.slitherine.com/games/fantaskommew). 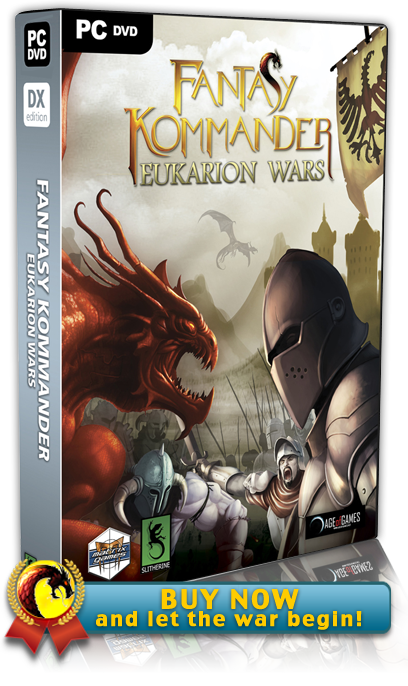 we're only a week to the release of Fantasy Kommander - Eukarion Wars. Today Wargamer.com has published an exclusive interview that you can not miss! The success of this project is in your hands, so if you think that we did a good work and you like what we do please help us to SPREAD the VOICE in the web and to the world! Let the WAR of EUKARION Begin! The ogres are celebrating a ritual north of the ancient forest of the spirits. Marcus and the Adamantia Human Army must stop it any cost. 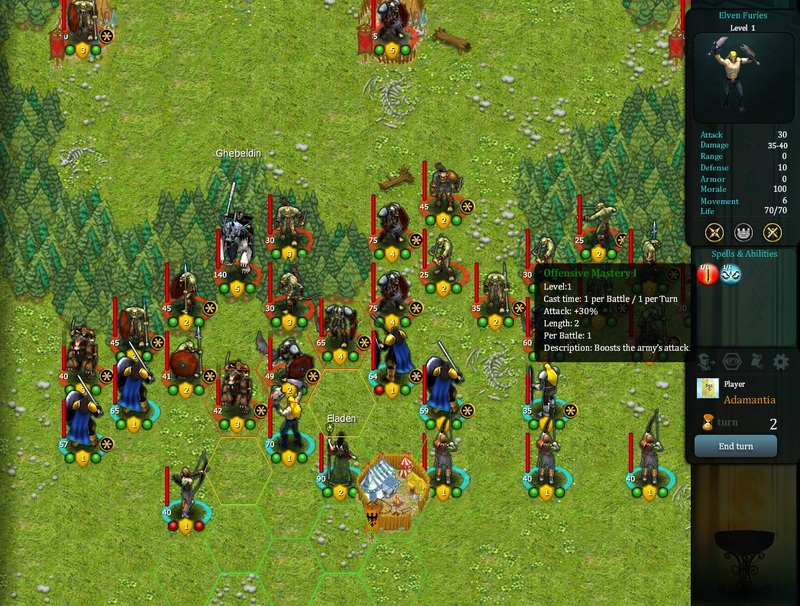 Human Archers are shooting at demoralized goblin slingers. A group of Dwarves is seriously entrenched around one of their city. Elven Guardians are using the special ability “Defensive Mastery” to face at the best a hard battle against an army of undeads. Eladen, the elfish enchantress, advances to conquer an adamantia castle that was captured by goblins and that is the main objective of this battle. 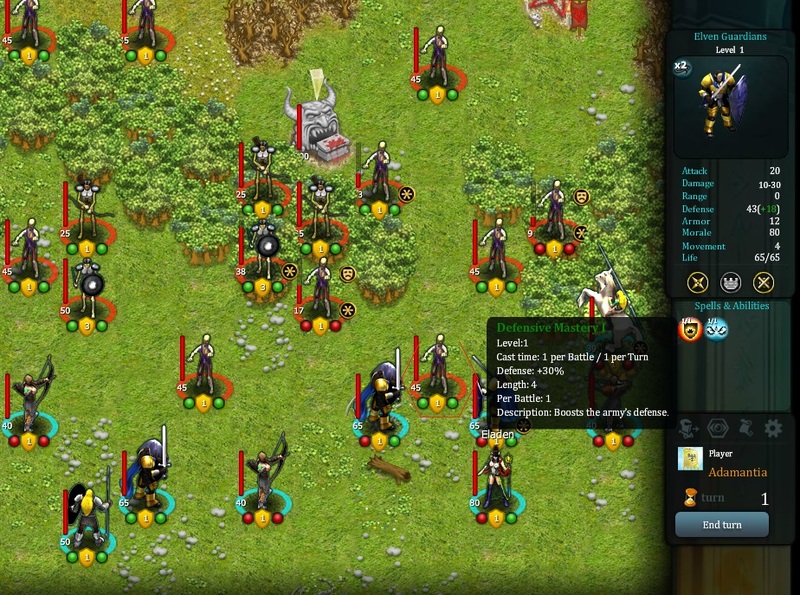 The elves deploy the army before the battle starts. Since the zombies exerts automatically their ZOC (Zone of Control) Marcus, noble knight of Adamantia, manoeuvres to reach a better place on the battlefield. 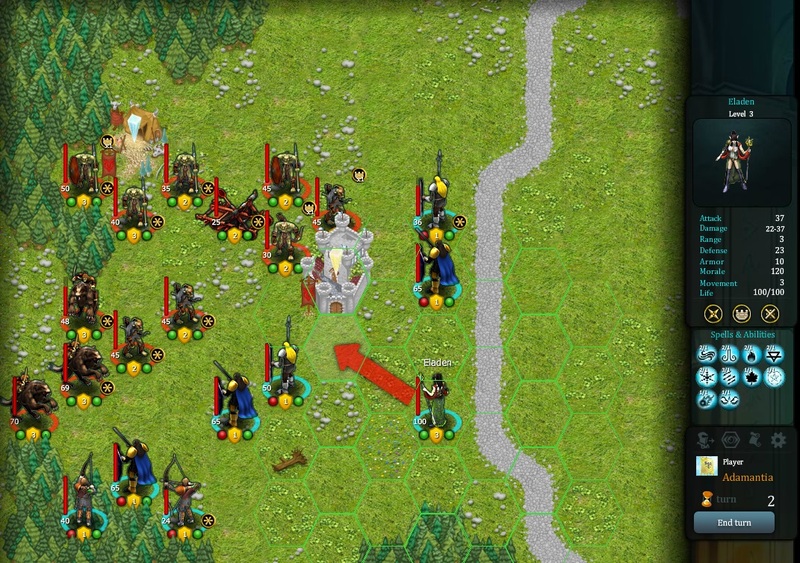 Elven Archers attacks a unit of skeleton warriors. 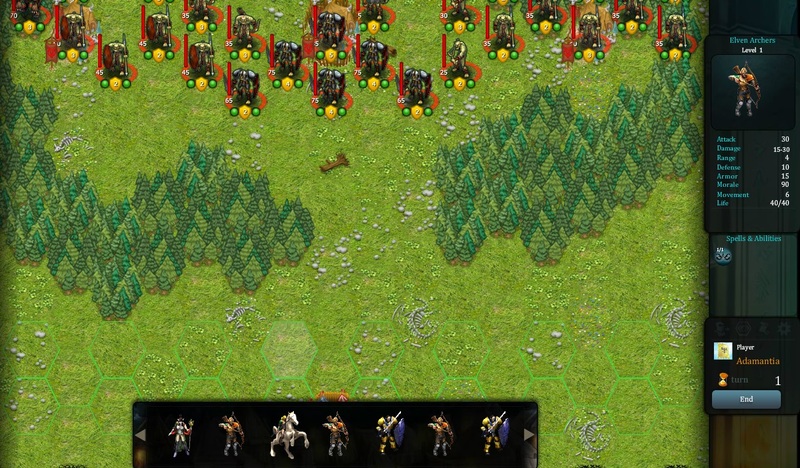 Elven Guardians attacks a unit of skeleton warriors that, as written in the battle prediction window, has the defensive support of an adjacent unit of skeleton archers. Yumak, Sacred Axe of the Dwarfs, moves in the city of Fabel and attacks a unit of Orcs on a bridge. There are several terrains in FK-EW. The main ones are: Plains, Forests, Hills, Mountains, Marshes. 4 Races in their “native” territories: Elves and Goblins in the Forests, Dwarves in the Mountains, Trolls in the Hills and Orcs in the Swamps. 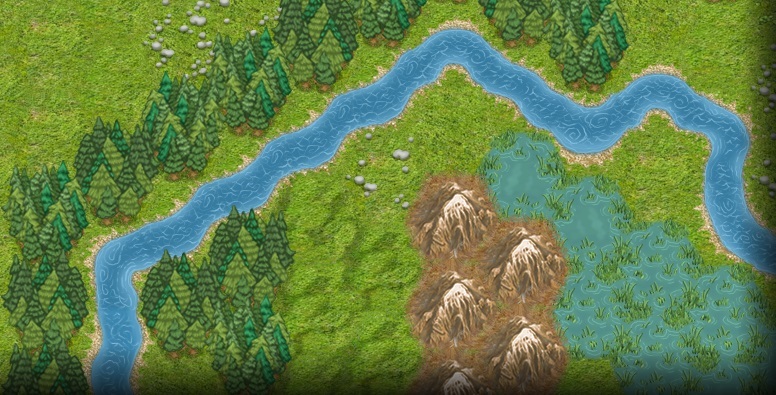 All these units have special bonuses in these specific terrains. Eladen, the elfish enchantress, advances to conquer an admantia castle that was captured by goblins and that is the main objective of this battle. 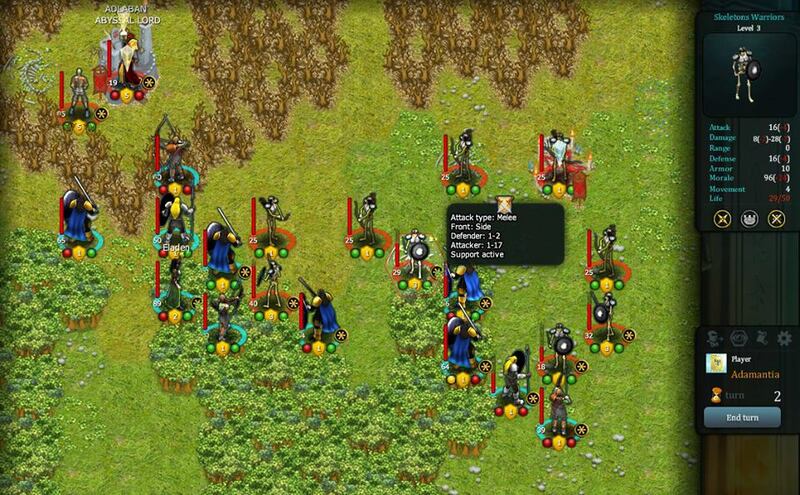 Elven Furies unleash the special ability “Offensive Mastery I” before a melee attack. 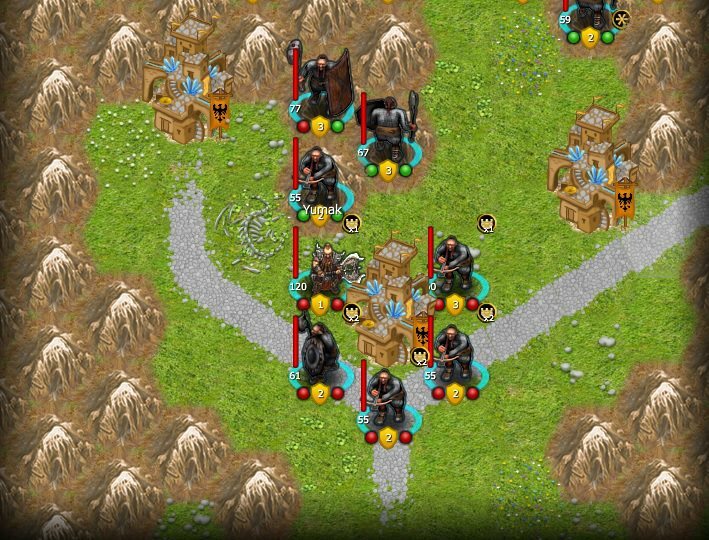 Dwarves Defenders entrenches to defend better the position on the battlefield. The Kommander follows the war events on the world map. 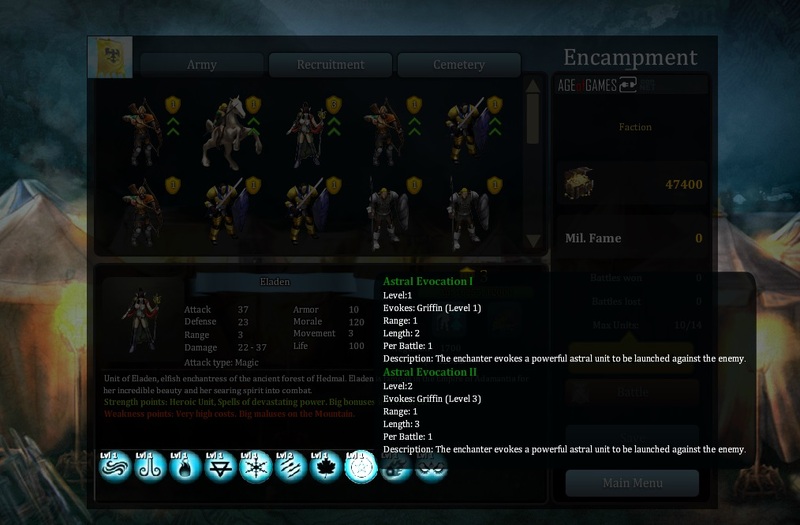 Welcome in the Encampment Kommander! Here you can buy, sell, upgrade (or resurrect!) the units of your army. Unit Upgrade: Stats Points Assignment. You can save (or load) anytime your games. Eladen, the elfish enchantress, upgrades the spell Astral Evocation. Epic War, Hexagons, Turn-Based Strategy, Boardagame, Rpg, Miniatures, Dragons, Demons, Mystery, Heroes, Kaos and Legendary Adventures... If you like these words you can't miss Fantasy Kommander. If the answer is YES, you can't miss this game because everything in it reminds of the incredible gaming experience that SSI created in its titles. 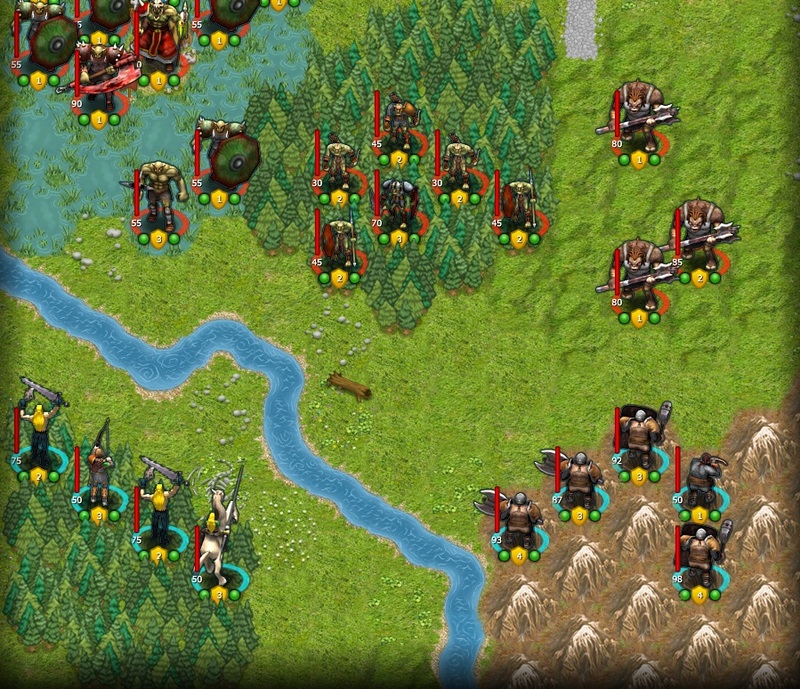 Great turn-based strategy and RPG games such as Panzer General, Fantasy General or Pool of Radiance inspired and guided us in the development of our project. 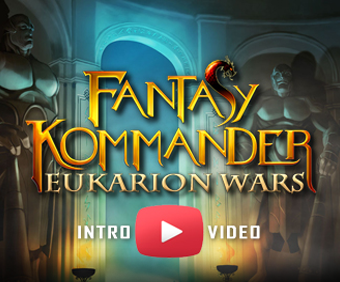 However, with “Fantasy Kommander: Eukarion Wars” we've tried to do better than our masters, adding depth to the gameplay, to the story and the setting for this genre. 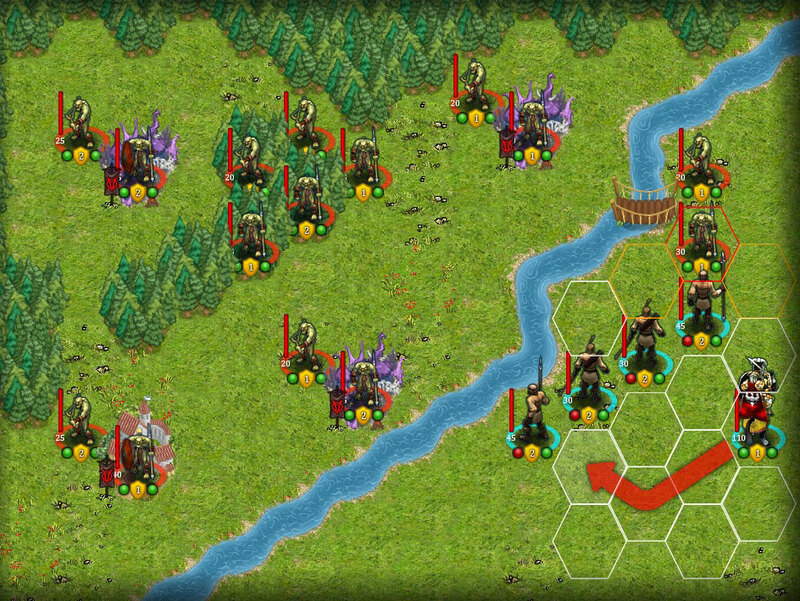 The gameplay is based on a traditional hex map, with a wide variety of terrains and units available.Most of your interactions with the game will be through the mouse. You will select, move, fight, and analyze units on the Battlefield or in the HeadQuarters (HQ) using a simple point-and-click system. 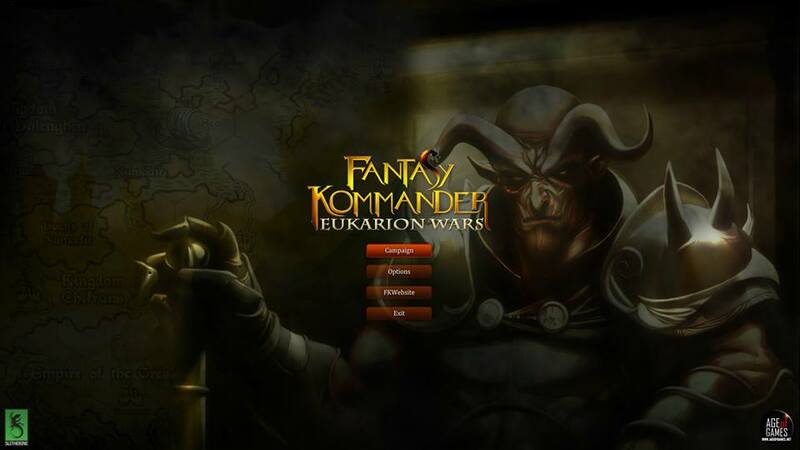 “Fantasy Kommander: Eukarion Wars” is an operational-level game: units approximate squads, with most of them consisting of about a hundred soldiers, though some (e.g. heroes, dragons) represent single entities. Every unit is like a RPG character with its own characteristics and special abilities that you can increase as soon as they level up. An important factor during a battle, is the orientation of the units: attacking the enemy on the flank rather than the front can make the difference between victory and defeat. 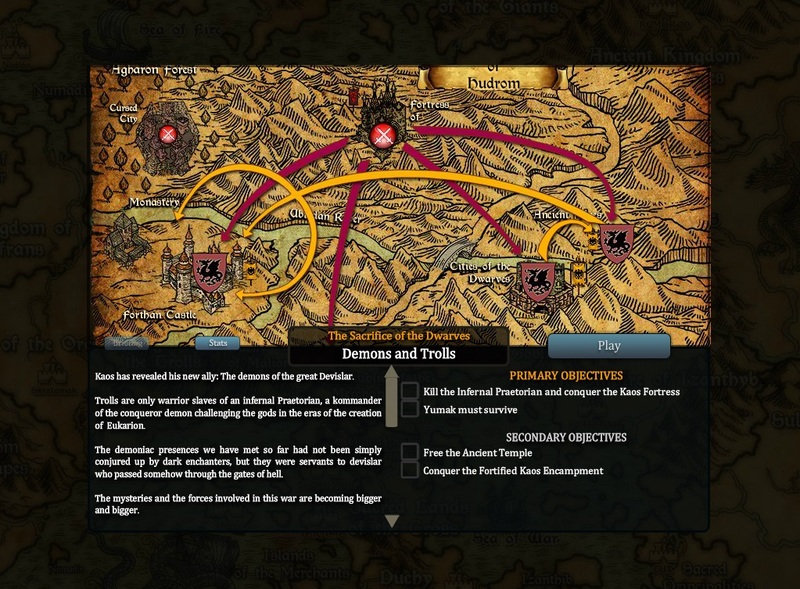 For all these reasons, and many other that you will discover in the game, maneuver your army carefully, and keep in mind that in order to become a great Kommander you must be able to take the right decision at the right time. The game features single player campaigns following a intricate plot (see “The Story”). 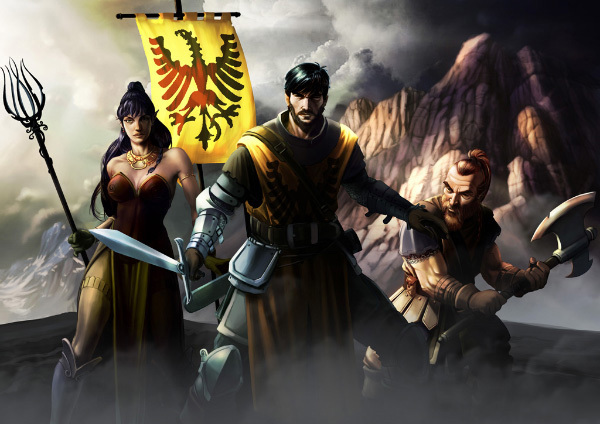 If you like strategy games, RPGs, and detailed fantasy settings, you can't miss the opportunity to play Fantasy Kommander. The plot develops during the single player campaigns, on and off the battlefields. There are 4 campaigns available, three of them take place in the great Empire of Adamantia, invaded by the forces of Kaos, and one in mysterious and unknown lands. Players play a Kommander at the beginning of their military career, thrown into a titanic battle that is devastating the entire continent of Eukarion. Successive events, dialogues, and plot twists are carried on through the messages that Emperor Karl and the Great Council of Mages send to the young general who will have to find out, fighting hard battles, the final objective of the Abyss. The game has been FULLY voiced in English and it's been conceived to give emphasis to the characters, friends and foes, that players will face on their adventure. We put a lot of care in the development of the setting, creating a huge fantasy version of Medieval Europe. Empires, kingdoms, history and everything else on the map that you can see down here are the result of studies and researches aiming at a coherent fusion between reality and fantasy, following the great tradition of European epic and fantasy literature. “Fantasy Kommander: Eukarion Tales” shows how Medieval Europe could have been if Orcs, Magic, Dragons, and demons of the deep abyss were real. If you want to know more about the way the lead designer of FK:EW designed the history of the Eukarion Continent, have a look at this entry in our Dev Diary. Why Kommander and not Commander? The background reason is that in Adamantian Language the right way to write commander is Kommander. To be honest, it's simply because the lead designer is stupid and he like K's. Fantasy Kommander is not a simple Wargame. It has a whole world inside of it, with several races struggling for supremacy. Here we want to show you some of them, with their characteristics, strengths , weakness and more. Humans are the dominant race in the Empire and they are perhaps the most difficult race to understand. They can be brave warriors or despicable cowards, great leaders in search of justice or bloodthirsty tyrants corrupt to the core.. For these reasons it is not easy to read in the hearts of men and it is not always wise to trust them. Human troops are generally versatile. With the exception of Men at Arms we can say that infantry (including archers) are better as defensive troops and mounted units (lancers and feudal knights) are better as offensive troops. Human Archers are mostly recruited from the hunters of Adamantia. These men, despite their light equipment, are brave and fearsome fighters. This is not the best human army but it's very useful to hit the enemies from distance. Ranged Attack which allows you to damage the enemy without suffering counterattacks. In defense supports an army that is attacked. Low Endurance. It's better not to use it in melee fights. NOTE: “Elite” Means the maximum level of a Unit, that is 5. 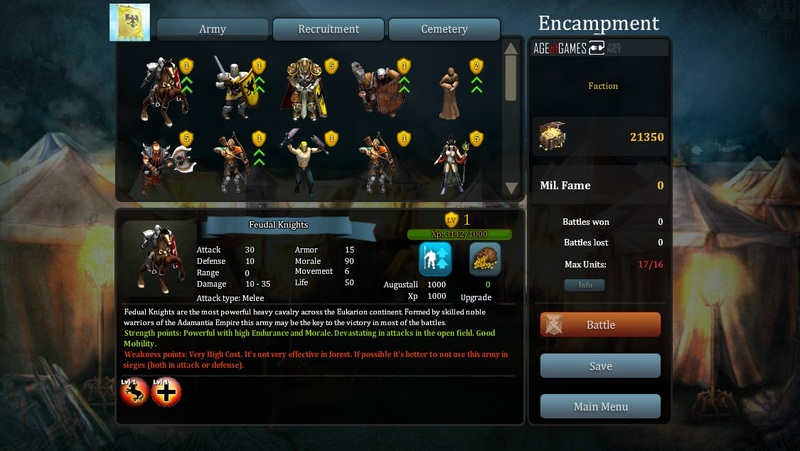 Human light infantry is the fastest imperial army in the plains (Elves are unattainable in the forests and Dwarves are unbeatable in the mountains). It can be used for rapid attacks and retreats, or to encircle the enemy in order to reach very fast the objectives. No armour, Leather Helmet, Spear. Low Endurance. It's better not to use it in frontal attacks. 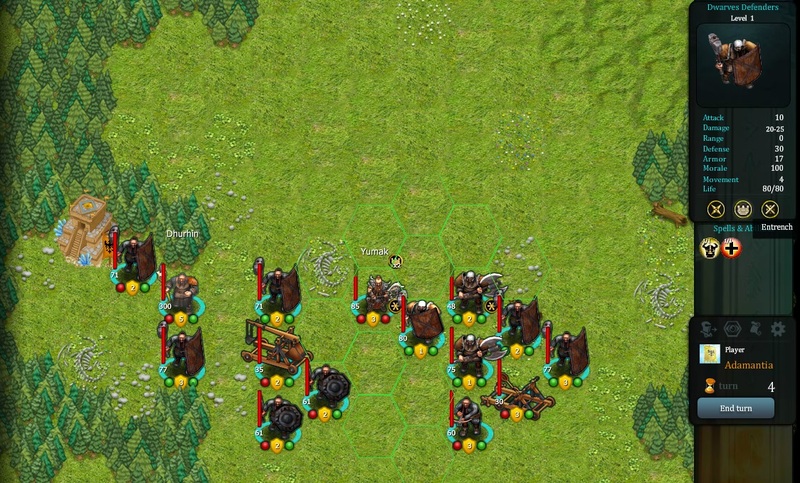 Infantry is a basic army that can be used to defend a village or hold the line on the battlefield. Used at the right time in the right place this army can be decisive to conquer or defend an objective and can face any kind of enemy. Studded Leather Armor , Leather Helmet, Medium Shield, Spear. It's a very basic army. This army, together with the feudal knights, is the spearhead of the human armies. It's formed by heavily armed dismounted knights. Men at Arms army are formidable on the battlefield and represent the best imperial force in sieges, either in offense or in defense. Heavy Chain Mail or Full Plate Armor , Knight Shield, Enchanted Sword. Powerful with high Endurance and Morale. Ideal for attacking and defending villages, cities, fortresses. This type of cavalry is recruited from the son of the rich merchant of the imperial urban bourgeoisie. It's a medium well trained cavalry that can be decisive in the open field. Chain Mail, Knight Shield, Knight Lance, Sword. Offensive Army. Powerful in attacks in the open field. Good Mobility. High Cost. It's not very effective in forest. It's better to not use this army in sieges (both in attack or defense). Medium/Low Endurance. Fedual Knights are the most powerful heavy cavalry across the Eukarion continent. Formed by skilled noble warriors of the Adamantia Empire this army may be the key to the victory in most of the battles. Magic Full Plate Armor , Holy Shield, Enchanted Knight Lance and Magic Sword. Powerful with high Endurance and Morale. Devastating in attacks in the open field. Good Mobility. Very High Cost. It's not very effective in forest. 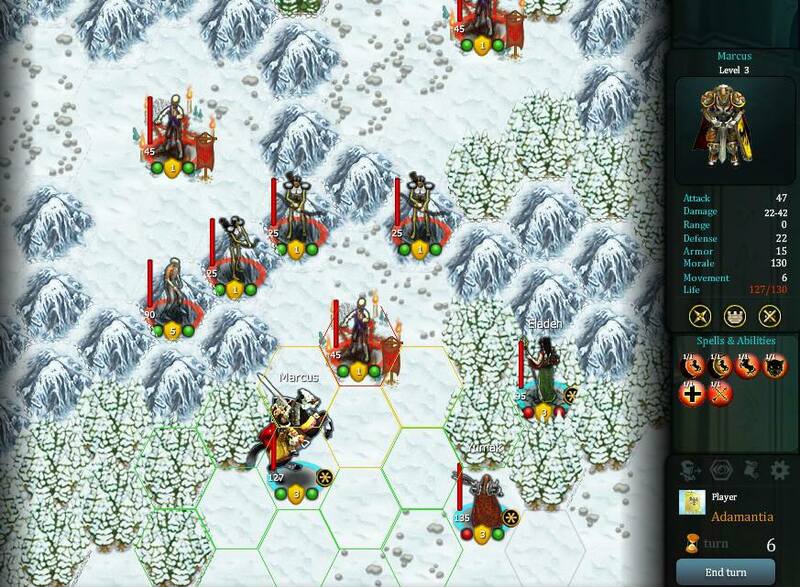 If possible it's better to not use this army in sieges (both in attack or defense). The clerics of Adamantia are ready to serve the empire in return for a small donation to the Church. They are men of peace and with miraculous healing powers who avoid battles, but they also know how to strike and defend themselves from the armies of kaos. Vulnerable and with a very low level of powers of endurance. (Translation from Elven language: “My heart sings to see thee , Warrior). There are 2 “Nations” of the Elves in the Eukarion Continent. All the Elves come mysteriously from the “Kingdom of the Ancient Elves”. During the 3rd century before the foundation of Adamantia, there was a bloody civil war and about 70% of the elves left the homeland. A part of the fugitives decided to live in peace with the other races in the heart of the Eukarion continent, while another part founded the Empire of the Supreme Elves. Ancient Elves: they are the most arcane, powerful and isolate. They have no interest in the political, economic or military events on the Eukarion continent. They study the essence of the magical forces of the Universe and try to live in balance with them. Hedmal Elves: these elves are the freest and most adventurous of their race. They take their name from the first forest, where they settled and they participated actively in the creation of the first empire of Adamantia. Elves have great bonuses when they fight in forests and big penalties in mountains. 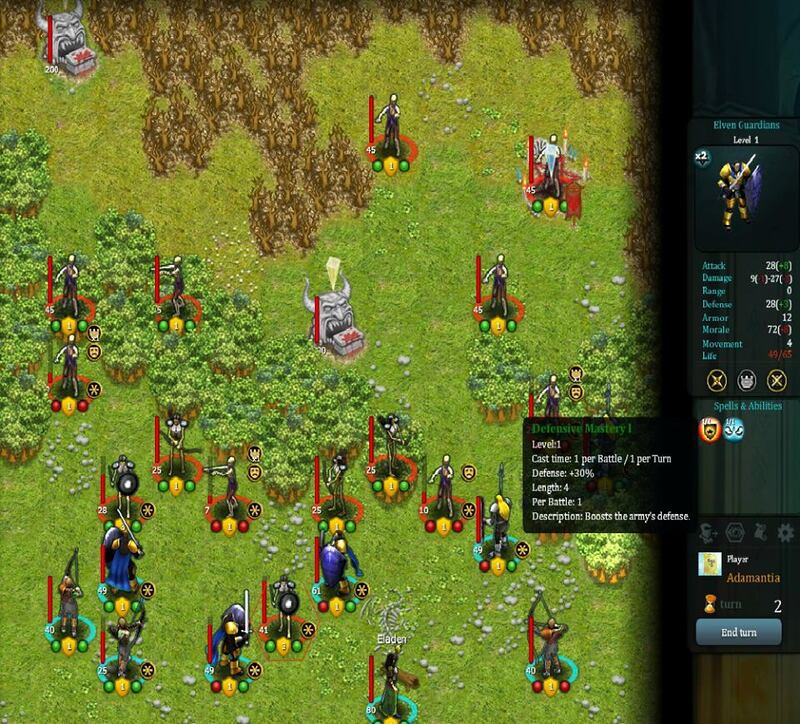 Elven Infantry is a good unit in both attack and defense. Well equipped and trained this unit can be a nightmare for their enemies in the forests. Chain Armor , Medium Shield, Spear. Elven Furies are the cries of the forest that strike the enemies. This is an offensive unit and it's very good to launch it in attacks in the woods. Great Bonus in Forest, High Offensive Power. They are the roots and the armor of the elven forests. Disciplined and armed with the finest weapons of Adamantia, the Elven Guardians is one of the best infantry types in the Empire. Full Plate Armor, Large Shield, Elven Magic Sword. Great Bonus in Forest, High Defensive Power. Elven Archers are the best archers in the Eukarion Continent. This is the elite unit of the elves. They are selected among the best elven warriors and receive a special training to learn to shoot arrows with the elven inner power of magic. The armor, bows and arrows of these incredible warriors are made of Mythril. Mythril Armor, Bow and Arrows. Great Bonus in Forest, High Offensive Power with Ranged Attack that allows you to damage the enemy without suffering counterattacks. In defense supports an army that is attacked. High penalty in Mountains. Low Endurance. It 's better not to use it in melee fights. High cost. This is an auxiliary light unit. Extremely fast, this cavalry is the only one that can be used easily in the forest. No armor, Elven Lance, Short Sword. Very High Mobility, Great Bonus in Forest. Low Endurance. High penalty in Mountains. It's better to not use this army in sieges (both in attack or defense). They are the spiritual essence of the elven woods. They are the priestesses of the temple of the sun and help the imperial army only in the wars against the sheer abyss. With their magic they can heal the wounded, fight the evil or invoke the blessing of nature. Healing Power, Blessing Spells to enhance the stats of friendly units. What's better than a beer in the mountains? Ten beers in the mountains! ...and if after ten beers you're still able to wield a Double Axe maybe the Dwarves will respect your orders in battle. The fierce dwarven people originated in the mountains of the holy city of Kumgrod (see the Eukarion Map). Legends say that this city was shaped by the Ancient Gods to be the pillar of the Eukarion Mountains. Most of the Eukarion Dwarves live in their Ancient Kingdom located in the extreme northeastern part of the continent. This Kingdom is powerful but isolated from the rest of the world. Only few trades are permitted and most of the people here don't trust the other races (particularly the elves). In the first century before the foundation of Adamantia, two groups of young Dwarves, driven by a “strange” desire to know the world beyond the borders of the ancient kingdom, decided to leave their home in search of adventure. These Dwarves were called the “crazy travellers” from those who remained in the mighty mountains of the Ancient Kingdom. One group decided to travel by sea, the other by land. The “sailors”, after great adventures in the northern seas, arrived at last in an island full of mountains and established there a New Kingdom. Some of their best ships go once a year to the ports of the Ancient Kingdom to keep the bond with their brothers alive. The “marchers” fighted their way through the hated kingdom of the giants and the lands of the dark races. These dwarfs became incredible warriors forged by fatigue and pain. After years of fierce battles the marchers settled their new home in the Mountains of the first empire of Adamantia becoming, with elves and humans, citizens of the first multiracial empire of Eukarion. Dwarves have, obviously, great bonuses to fight in mountains and big penalty in forests. Generally Dwarves are better as defenders. This basic unit is composed by dwarven miners and workers. Although not professional warriors these dwarves are well equipped and trained, great defenders of fortresses and mountains. Chain Mail Armor , Medium Shield, Axe. Great Bonus in Mountains, Good Defense, Cost Effective. These are the fierce warriors of the Dwarves. They are heavy, dirty and angry! Heavy Chain Mail, Tower Shield, Warhammer. Great Bonus in Mountains, Good Defense, High Endurance. They are the best and most bloodthirsty fighters of the Dwarves. Only dwarves with no fear of death are allowed in this unit. Dwarves Plate Armor, Dwarves Double Axe. Great Bonus in Mountains, Good Defense and Attack, High Endurance. High penalty in Forest, High Cost. 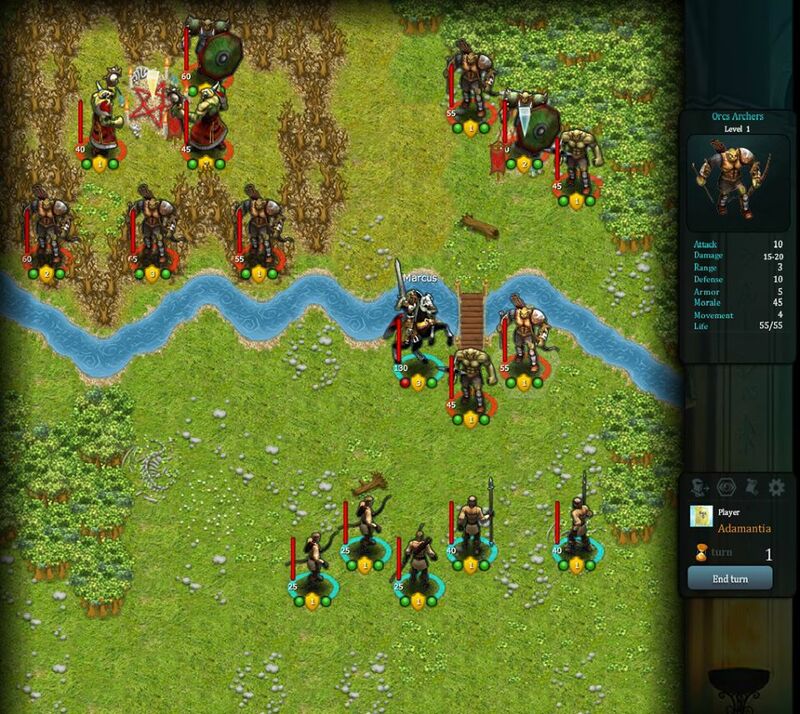 Dwarves Crossbowmen is a really strong supporting unit. 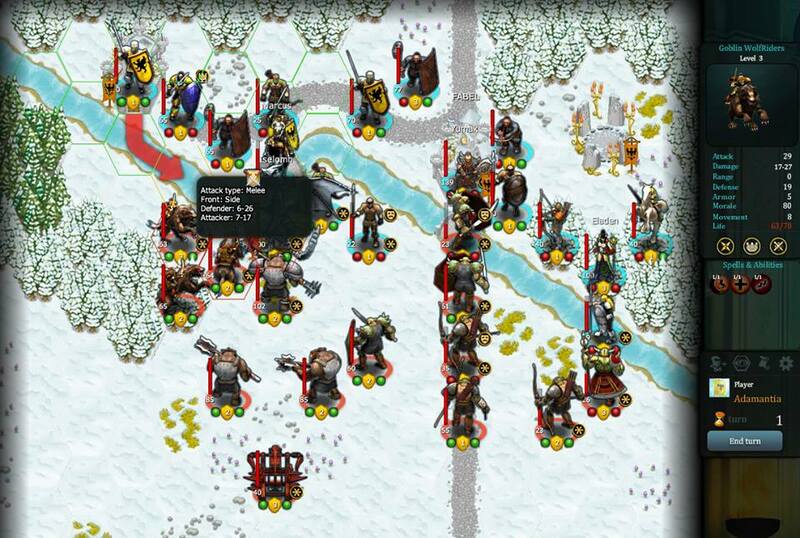 Thanks to the high endurance of the Dwarves and their well crafted armour this unit is very useful in siege battles. 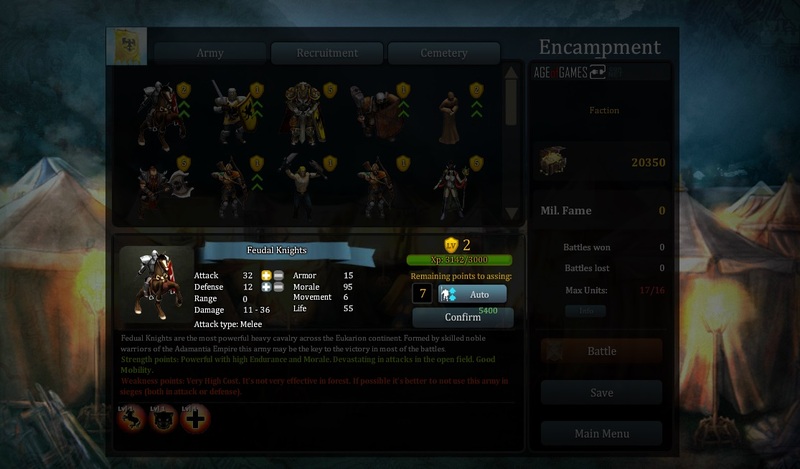 Great Bonus in Mountains, Ranged Attack that allows you to damage the enemy without suffering counterattacks. In defense it supports an army that is attacked. High penalty in Forests. It 's better not to use it in melee fights. They are the holy guardians of the dwarven temples and cities. They are forged by the magic of the earth and not even death may deter them from their mission. Dwarves Magic Armor, Dwarves Magic Shield, Holy Warhammer. 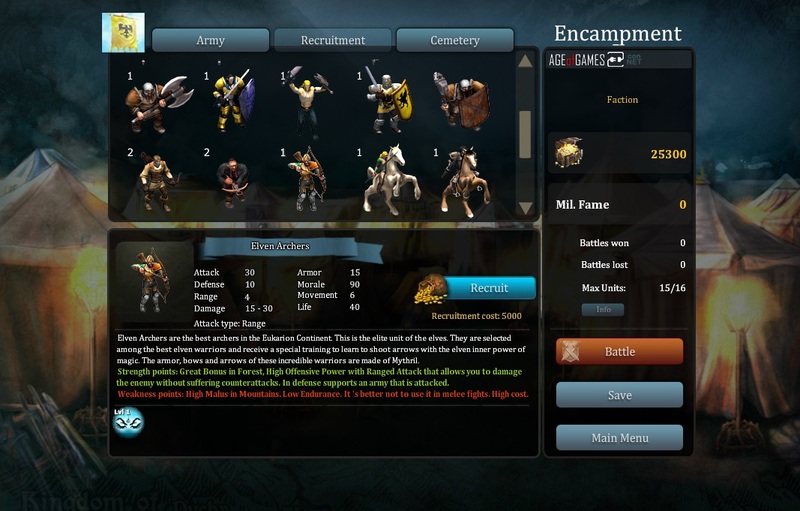 Great Bonus in Mountains, Very High Defense, Good Attack, Very High Endurance. They're small, green, and angry. They love darkness, poison, and sacking. The most brave ride ferocious wolves and shouting dreadful cries in battle. The goblins inhabit the most dangerous, dark and savage forests of the Eukarion continent. They generally live in small tribes devoted to hunting and sacking the neighbouring lands. They're short, but swift and frightful in battle for their fierceness and their mischievous ambushes. In the Eight Year of the First Empire of Adamantia, Ghebeldin the Great, with the help of legendary shaman Hudrum, was the first able to found a Goblin Kingdom (See World Map). This barbarian kingdom assembles thousands of tribes of terrible and bloodthirsty warriors whose greatest aspiration is to pillage the damned races that live in their neighbouring lands. Armed only with spears and courage, these goblins are swift and lethal. High mobility and low cost. Bonus in the Forest. Low resistance. Better not to use it in frontal attacks. Warriors from the goblin tribes always ready to fight and cut heads off! High mobility and moderate cost. Bonus in the forest. They're the tallest and toughest goblins. The equipment of this terrible infantry is made of the best weapons and armors stolen from enemies killed in battle. Chain mail and plate armor, poisoned sword, iron shield. Good offensive and defensive abilities. Bonus in the forest. Agile, slender and always ready to runn. 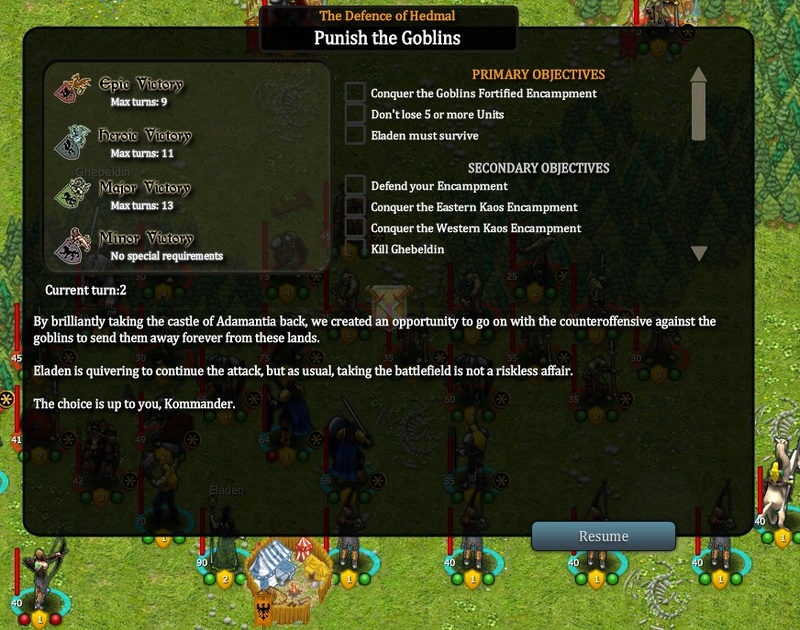 Goblin slingers look weak, but they're many and they're angry! High mobility and low cost. Bonus in the forest. 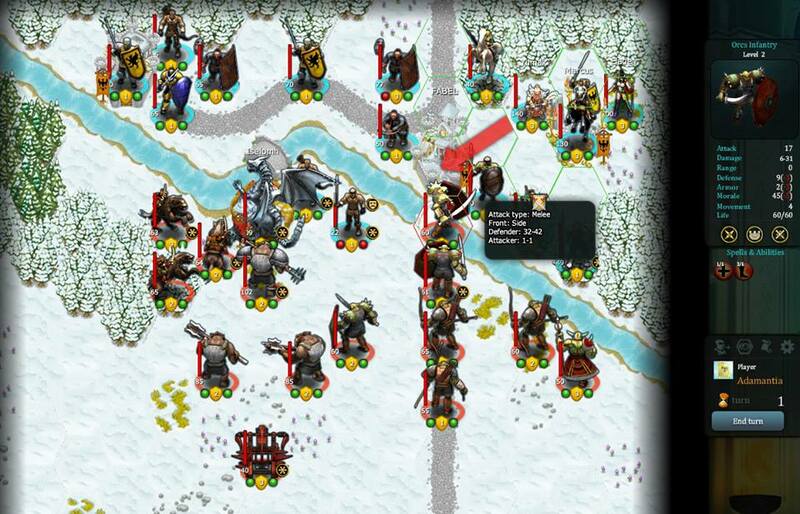 Long range attack that allows to hit the enemy without the risk of counterattacks. While defending, it can support an army under attack. Very low resistance. Very vulnerable in short range combat. 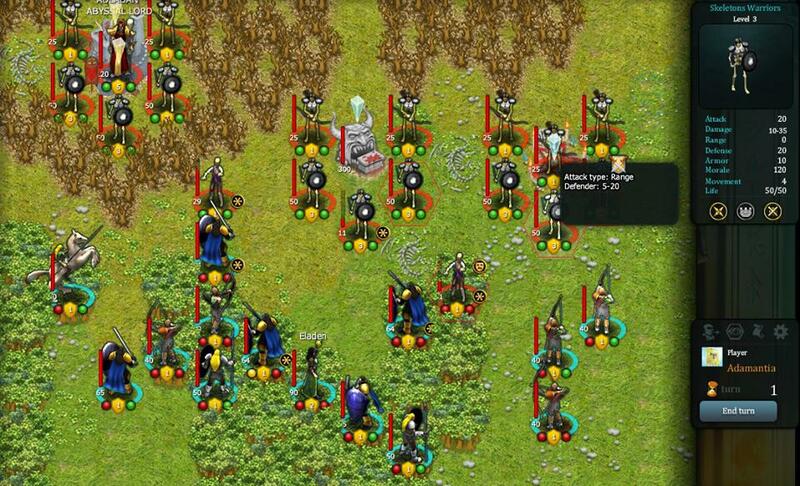 Skilled shooters, goblin archers are always hunting for new preys to torment with their arrows. Bonus in the forest. Long range attack that allows to hit the enemy without the risk of counterattacks. While defending, it can support an army under attack. Very low resistance. Vulnerable in short range combat. Among the best goblin warriors. Equipped with bow of superior workmanship and leather armours blessed by goblin shamans. Ferocious and savage, the wolfriders love to pounce on the backs of their enemies. Only the strongest and most bloodthirsty goblins can be part of this special unit. Offensive unit. Good for attacks in the open field and inside forests. Great mobility. Bonus in the forest. 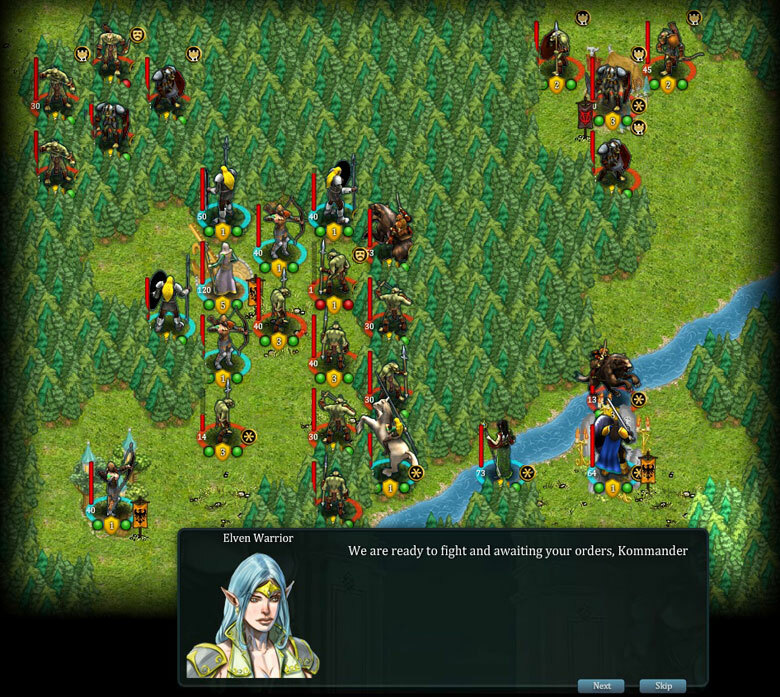 Fantasy Kommander - Eukarion Wars features an extensive map, hundreds of units each with its own experience level and abilities, and an immersive background story based on legends and folklore from European history that really adds to the game’s atmosphere, giving greater depth to the gameplay. 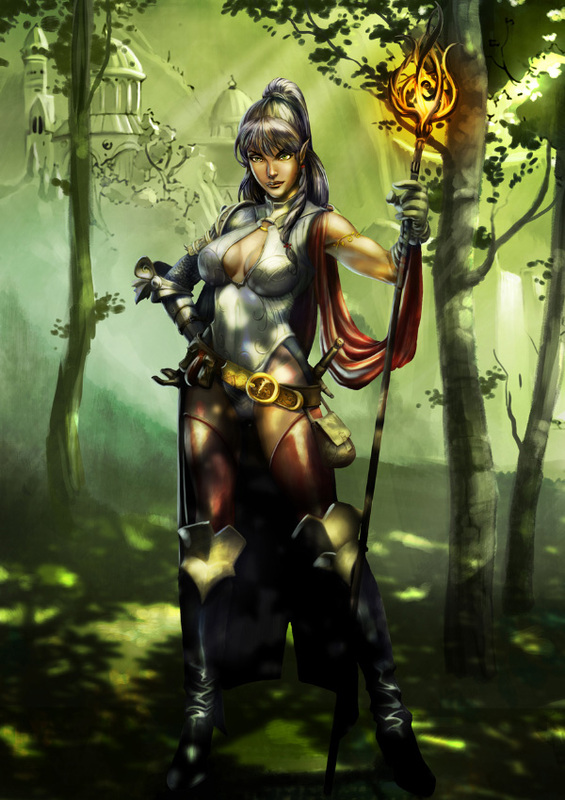 If you want to see what the game can offer you, you can download the Game’s Manual, where you will be able to find any aspect, information and features of Fantasy Kommander. 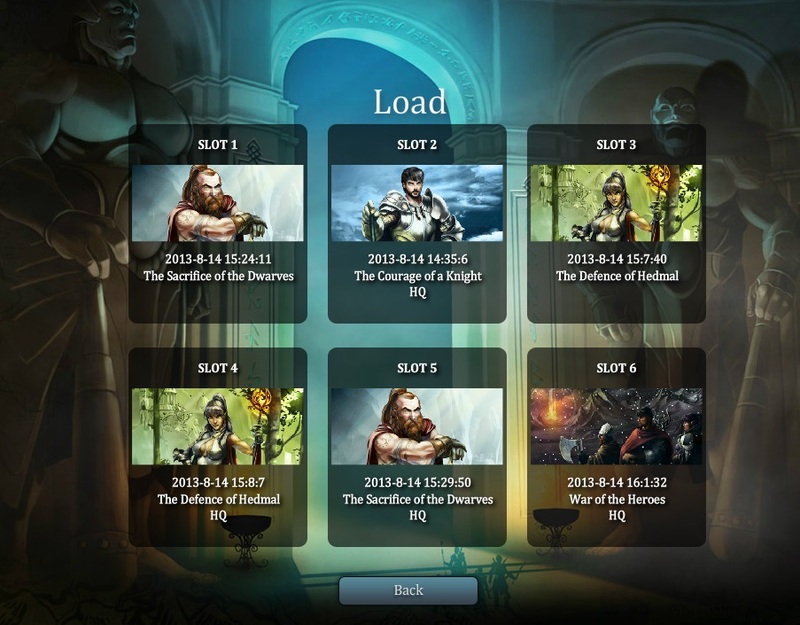 Age of Games is a project created by two independent game development companies, P.M. Studios and Foofa Studios. Both companies have a great passion for videogames and developed several RPG and strategy games together. We have a strong independent nature and we hope to be able to create great games outside of the logics of casual gaming and mass market.